Often when I’m playing around with my labs in VMware Workstation*, I need to use many different subnets. Trying to manage multiple subnets using the “Virtual Network Editor” I’d always found was a bit of a chore. So - since I just happened to be setting it up again - I thought I’d share how I’ve been doing it. *I’m still using VMware Workstation 9, not yet upgraded to 10. - VMnet1 is a custom network - no NAT, no bridging, no host connection, no DHCP, and it’s totally irrelevant what the subnet is! In fact, since I don’t use VMware Workstation’s DHCP or NAT services, I disable them in services.msc. 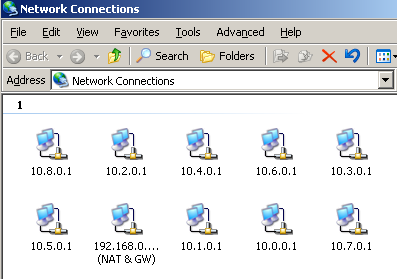 All of my VMs are configured on the VMnet1 network, except my special one, my ROUTER. The ROUTER is simply a Windows Server 2003 VM (actually R2 SP1.) 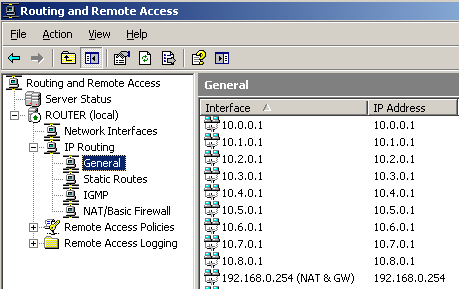 And it is configured with VMware Workstation 9’s maximum of 10 network adapters. 1 of the network adapters is on VMnet0 which is bridged to my home network. 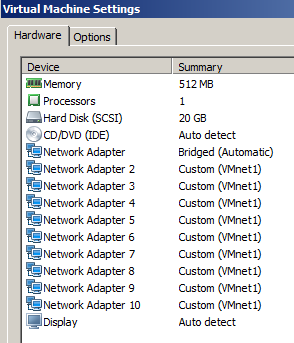 The other 9 network adapters are in the VMnet1 network. 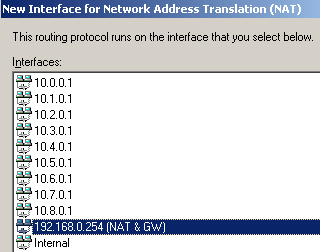 When the ROUTER VM is powered up, I manually configure an IP address on all the network adapters. The bridged adapter - is given a static IP addresses on my home network. The other nine adapters - are configured as the default gateways for up to 9 other VM network subnets as per requirements. Note: Only the bridged adapter has default gateway and DNS configured. The Network Connections are renamed to clearly identify their purpose - as in the picture below. 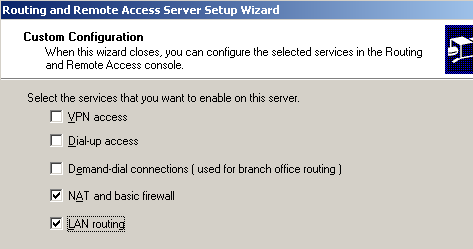 Configuring the Windows Server 2003 box as a router with the ability to do NAT is a doddle. Image: R&RA ... start the service? And that’s all you need to do to get your inter VM networks to communicate with either other. The router acts as the gateway for these networks and passes the traffic from subnet to subnet. We’re not finished yet though! So, you’ll probably want to connect to your VMs from your workstation or home subnet (in case you’re wondering why not simply use a HOST connection in VMware Workstation to get to the VM Networks, well, I certainly could, just had some oddness in the past with host connections - the statically assigned host IP kept failing to an APIPA address after rebooting my workstation - which is one of the reasons why I do it this way.) Your workstation will need a route to get to these networks. We’re (still) not finished yet though! Now you might want your VMs to be able to get out to the internet. 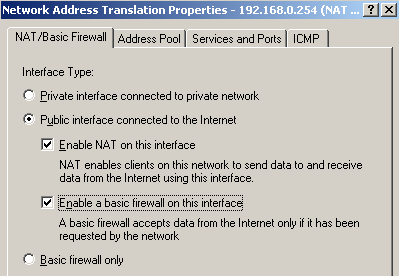 Select your NAT interface and click OK.
*This is not necessary for what we want to do - I tend to do it all the same! And now we’re completely finished! Our VMs can talk to each other on different subnets, we can talk to our VMs from our home network, and our VMs can talk to the outside world. But wait ... when you enable NAT, from your home network you will not be able to talk to your VMs. This could be fixed by enabling the host connection in VMware Workstation’s Virtual Network Editor and not configuring static routes in DOS. Personally though, I quite like this - I don’t want my VMs talking to the internet unless I’ve got a specific reason to let them. 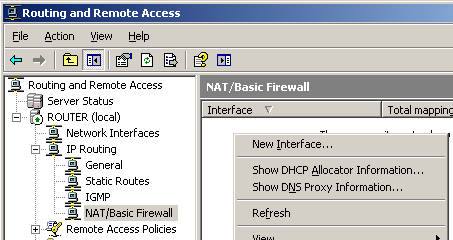 To re-enable access from your home network to your VMs simply right-click the interface under NAT/Basic Firewall in Routing and Remote Access and click Delete. 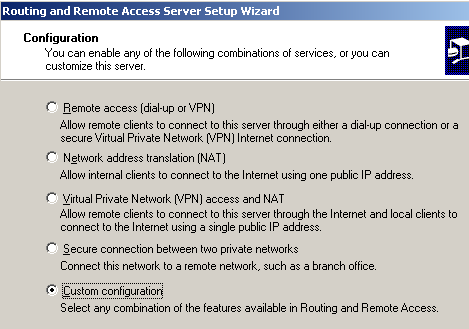 Note: If we had SNAT (Source Network Address Translation) in Windows Server 2003 R&RA, we could have our cake and eat it (VMs connecting to the internet, and us connecting to them from our home networks.) Perhaps it’s about time I found a replacement for my tried and trusted 2003 R&RA!? ... quite a long tip! ?